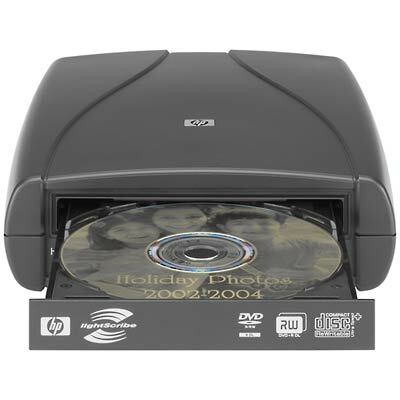 My DVD Writer on my laptop has been playing up so rather than waste too much time trying to fix it I ordered a rather competitively priced HP dvd840e Super Multi DVD Writer from DABS. It’s an external DVD writer that makes use of LightScribe technology which allows you to turn burn laser etched labels onto your DVD. I haven’t used it extensively enough yet to say how reliable it is, however, I used it to burn Windows Vista RC1 which is a hefty 2.5GB and I’ve now installed on my laptop and tablet PC. Easily preserve, edit and share up to 8.5GB of video, photos, and multimedia presentations on one double-layer1 disc—and quickly store, back up, and transport files on DVDs and CDs. This external, high-speed Super Multi drive features DVD±R/±RW and DVD-RAM read/write, plus ±R double-layer capability. And the dvd840e has a newly upgraded version (1.2) of LightScribe2 direct disc labeling! Fortunately, I haven’t had that problem yet. If you do manage to solve it, please post your solution or link to the solution on the blog.